malicious software are hidden in websites that you visit. 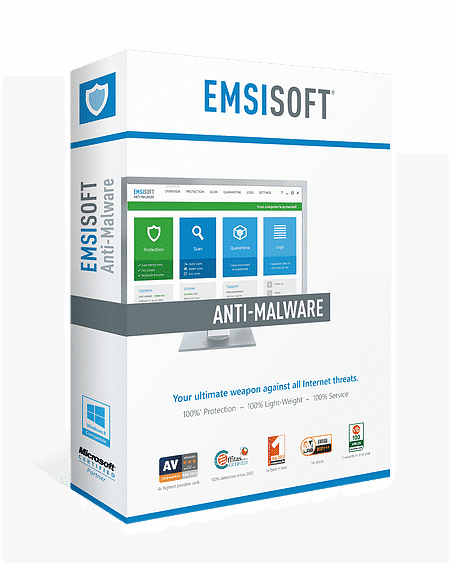 With Emsisoft Anti-Malware, your machine will be protected from connecting with or becoming infected by these harmful programs. File guarding protections work 24/7 to verify that all downloaded or modified files have been scanned using the award-winning, lightning-fast Emsisoft dual-engine scanners, without bogging down your computer while they run. Emsisoft Anti-Malware works around the clock to monitor active programs, alerting you to suspicious activity and halting even the very newest threats that aren’t known by signatures yet. Custom-designed behavior monitoring tools keep ransomware from encrypting files on your machine. If you need to renew, please fill out form at bottom of the page and a technician will give you call.